Brenda really surprised me this year with a Christmas gift that I've been eyeing up since I saw it advertised in my Instagram feed a couple of months ago. It's a new drawing tablet called "The Slate" by the iSkn company located in France. For week one of Create-A-Thon 2017 I've been sketching with it attached to my iPad Mini and MacBook Pro. The Slate can also be used in standalone mode for on-the-go sketches that can later be imported with your computer or iPad using the Imagink app. The tablet includes a paper sketchpad, two clips to hold sketch paper to the tablet surface, a ballpoint pen equipped with a magnetic ring, graphite pencil with removable magnetic ring, and a usb cable for charging. My Slate also came with a nice carrying case with a snap closure with room to carry my iPad Mini. The Slate is very lightweight and of nice build quality. The Slate works with paper attached, allowing you to make sketches while seeing the results in real time on your bluetooth synced iPad or usb cable connected computer using the Imagink app. Imagink has several tools with size and opacity adjustments and the ability to create layers. Throughout my testing of The Slate this week, I found both the pen and the pencil with magnetic ring to be very accurate in capturing what I was drawing. The removable magnetic ring can be attached to your own pencils, provided they fit the included adaptor. I've only found a few of my art pencils that fit, but a larger size adaptor is available from iSkn as well as a stylus called The Tip that allows The Slate to be used as a drawing tablet. I've added the larger magnetic ring adaptor and The Tip to my birthday wish list. The Slate can also be used on-the-go to make sketches that can be edited or imported later on your iPad or computer (pc and mac). Sketches can be exported from the Imagink app in jpg, psd, svg, png, bmp, as well as video mp4. I experimented with exporting different file formats, and found the files imported as expected for further editing in Photoshop and Illustrator, with layers also being imported. I have to say that I really am impressed with The Slate and how well it captures my sketches, though I'm not really sure how it will fit into my creative workflow. I will be practicing drawing more with it and look forward to watching what others create using The Slate. 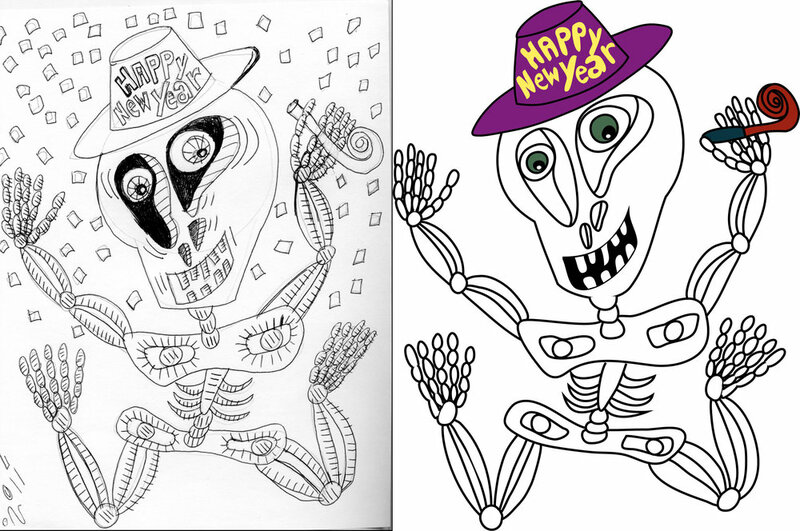 I've included side by side sketches, actual pen or paper sketch on the left with Imagink files on the right. Next up in Create-A-Thon 2017, I will be trying out Derwent Graphitint Pencils.